On Saturday, May 23, the martyred Archbishop Oscar Romero will be beatified, 35 years after he was assassinated while celebrating Mass in the modest chapel of Divine Providence Hospital in San Salvador. Columnist James Keane is in San Salvador and will be reporting from the ceremony for America. Check this page for ongoing coverage and dive into our collection of articles, videos, podcasts and more on the archbishop who lived and died giving voice to the poor and preaching a message of liberation to oppressed and oppressor alike. The Ignatian Solidarity Network will be live-streaming the beatification ceremony here, at 12 p.m. ET. Tears from some hard characters. While the beatification ceremony for Oscar Romero will be held today in Plaza El Salvador del Mundo in San Salvador, many pilgrims are also visiting La Capilla del Hospital Divina Providencia. Óscar Romero was killed out of hatred of the faith, dying a martyr’s death—not because he was shot through the heart while saying Mass, but because he dared to make real the Gospel demands for dignity and justice on behalf of the defenseless and marginalized in El Salvador. He was wrapping up yet another memorable homily for those gathered in the church and those who would listen to his words later on the radio. “The harvest comes about,” he said, “only because it dies, allowing itself to be sacrificed in the earth and destroyed. Only by undoing itself does it produce the harvest. The Theological Commission of the Congregation for the Causes of the Saints concluded that Romero's words and actions in favor of the poor and for justice were motivated by his faith, and not by political reasons. This past summer I traveled to El Salvador as part of a delegation to mark the 25th anniversary of these assassinations, and I saw some of the many ways the country continues to suffer from the bitter fruits of war. “Romero matters regardless of the generation,” says Ana Grande, 30, a second-generation Salvadoran-American who is a community organizer in Los Angeles. “For the younger generation, although they didn’t have firsthand contact, it is a remembrance of faith and justice. All went peacefully through a succession of prayers, readings, hymns until the moment in his homily when Cardinal Ernesto Corripio Ahumada of Mexico, the personal delegate of Pope John Paul II, began to praise Archbishop Romero as a man of peace and a foe of violence. Suddenly, a bomb exploded at the far edge of the plaza. America Media is in San Salvador, covering the beatification of Oscar Romero. Here's our report from the Hospital Divina Providencia, the chapel where Romero was martyred while celebrating mass on March 24, 1980. Kevin Clarke reflects on the archbishop's ministry and how it was grounded in the Beatitudes. Priests in El Salvador prepare for the beatification of martyred Archbishop Oscar Romero and talk about what this step in the canonization process means to them. The soon-to-be beatified Salvadoran Archbishop Oscar Romero is remembered on the 35th anniversary of his assassination. 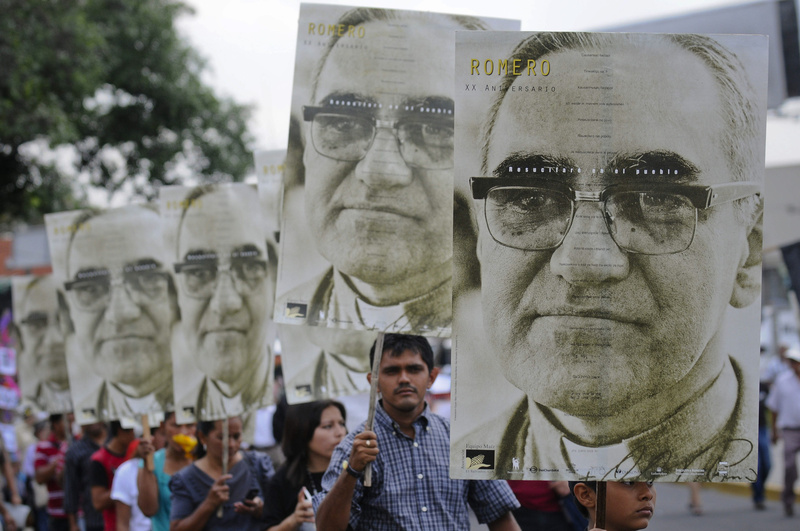 Salvadorans celebrate news that Archbishop Oscar Romero, assassinated in 1980 while celebrating Mass in a hospital chapel, has been declared a martyr for the faith. Chief correspondent Kevin Clarke, author of Love Must Win Out, a new biography of Oscar Romero from Liturgical Press, talks about the news that Archbishop Romero has been officially named a martyr by a Vatican commission. Pictures from the life of Archbishop Oscar Romero and from the city and people that he loved. Luke Hansen, S.J., took part in delegation to El Salvador from July 24 to Aug. 1, 2014, to mark the 25th anniversary of the assassination of six Jesuit priests, Elba Ramos and her daughter Celina at the University of Central America.